The main blades at the bottom of mixing bowl create high-speed shearing force to provide cutting and separating product function. Because the flat surface design on bottom of mixing bowl, when the ingredients are going through the center blades that create the hemispherical flowing with high-speed variable mixing speed(100-1800RPM). This mixer can make unified granule in 1~3min. Dry powder, wet powder, or oil, solvent, paste, color spice can be adding into this mixer during the mixing process. 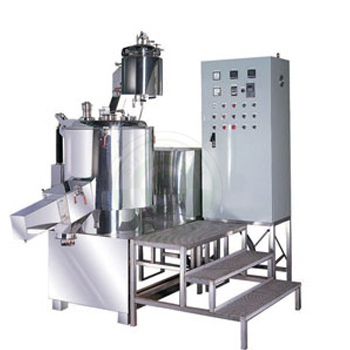 The features of this mixer are included special designing transmission gears, main shaft mixing blades, balance adjust, high-speed stirring blades, seal-up architecture lid, adjustable air-turbulence shield, double jacket device, pressurize discharge device, pressurize lid opening device, pressurize spraying device, and stirring solution device. For heat sensitive cosmetic, this mixer can keep its nature essentiality during the cooling process. In addition, vacuum, heating, cooling, pressurizing and liquid spraying functions can be operated in this mixer too. The blades are easy to remove for clear purpose.